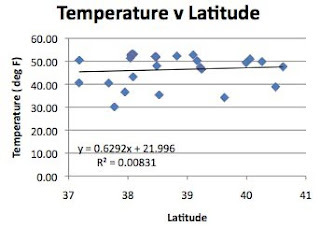 Today I am going to look at the temperature data for Colorado, since last week we looked at the data from Kansas, and the correlation with longitude was growing, but could not just be explained by a change in height. 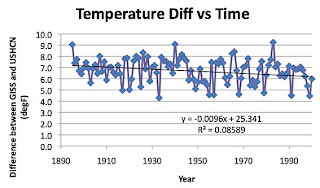 The procedure starts off the same as that for the initial post, in that I am going to take data from the US Historical Climatology Network compare it with the GISS data for Colorado, (which I reference later) and then see if I can draw some conclusions from the data. 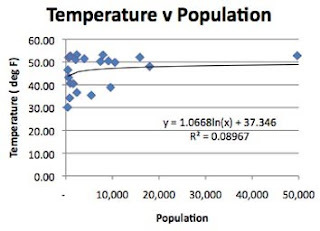 I want to have a hypothesis to test against the data, and since the land rises in the West, and it gets cooler, the hypothesis this week is that there is a relationship that we can derive between average temperature and height above sea level. There is a subsidiary corollary to this, which is that this will explain the changes in temperature with longitude. 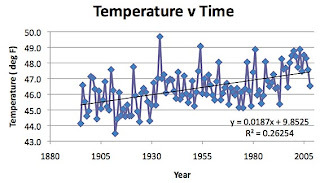 And there is a slight problem – in 1896 there is no temperature data for Telluride. Hmm! How to handle this? Well looking at the averages that for 1896 is on average 0.6 deg above that for the stations in the rest of the state. Telluride, on average is 9.54 degrees below the average for the state. So if I take the average for the state for 1896 and subtract 9.54 I get 37.1 degrees. If I take the average for Telluride and add 0.6 degrees I get 37.17 degrees. So it seems fair to insert a temperature of 37.135 degrees for Telluride for 1896 – which I did to complete the initial table. Now there is only one GISS station, but this is rather a large amount warmer for the state according to GISS than the state average would suggest. It has, however, been declining slightly, but steadily over the years. As for the state temperature as a whole, that has been increasing, though the pattern is a bit strange. So now I go to enter the population, and not being a Colorado native I had been wondering where the Denver data was, and apparently it is hiding behind the Cheesman file. (That being a suburb of Denver apparently with a Park). So do I use the suburb population 8,201 or that of Denver itself – 598,707? Given that the area has a high population density, I am going to use the Denver number. And then there is the problem of finding Hermit, CO – fortunately the weather station information includes the co-ordinates (since I didn’t have a great deal of success with a Google search) and this allows me to use Google Earth to go to the co-ordinates and find that it is at Hermit Lakes, which is in Creede, population 377. Putting all those together, there really are a lot of small communities in Colorado, so I’ll use a normal (rather than a log) plot of the information. And with this having a lot of data at the smaller end of the scale (and recognizing that we have yet to go to a state with large populations) there is some correlation to a log relationship. And changes in small populations could have a greater significant effect. (Which is what I had said earlier, and which is now being also being written about by Professor Roy Spencer. So the question is, can this all be explained by the changes due to height above sea level, or elevation? I don’t think that there can be any doubt of the correlation. So now we have two – where there is not a large change in elevation (Missouri) there is a strong correlation with latitude, but when the stations are at a higher altitude, then there is a strong correlation with elevation. And the starting hypothesis, this time, is seen to be correct. One wonders how it would be if we normalized the data to account for both elevation and latitude. Given the lateness of the hour I won’t do that tonight, but given that GISS gives the locations for the centers of the states, maybe I will adjust the data to that location based on the linear relationships and see what that produces, and how much variation it takes out. But I’ll do that later in the week (we have been beset by server problems today, and I would like to get this out before I get hit with another). Due to its altitude, Colorado is pretty much outside the circulation path of polar highs, hence the lack of correlation with latitude. There might be a correlation of precipitation with latitude, but this state may not be that large to capture that. I'm probably going to do Utah next where the elevations are not consistently rising westward. We'll see what we get. I'll also start running the precipitation tables for the different states. As demand rises, can oil supply keep up?